Revealing the colossal destructive impact of polytunnel industrial work sheds on Herefordshire’s finest landscape. Each pictures is but a section of a site. Polytunnels are used to provide class “A” strawberries demanded by supermarkets. The dark fields show hoops over plastic ground cover prior to the raising of the white plastic outer skin of the tunnels. 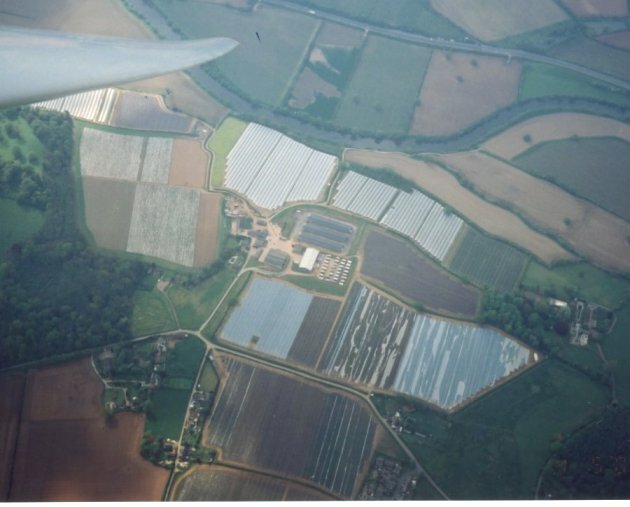 MARDEN “Once nominated best kept village” erected by S&A Davies Now sandwiched against a vast polytunnel site the size of an Airport with multi runway. Commotion extends as in an international airport into the night as the equally vast workforce share the hundred plus caravans (bottom middle of photo) in day/night bed rotation, destroying night time peace along with the devastation of an otherwise pretty Herefordshire village. 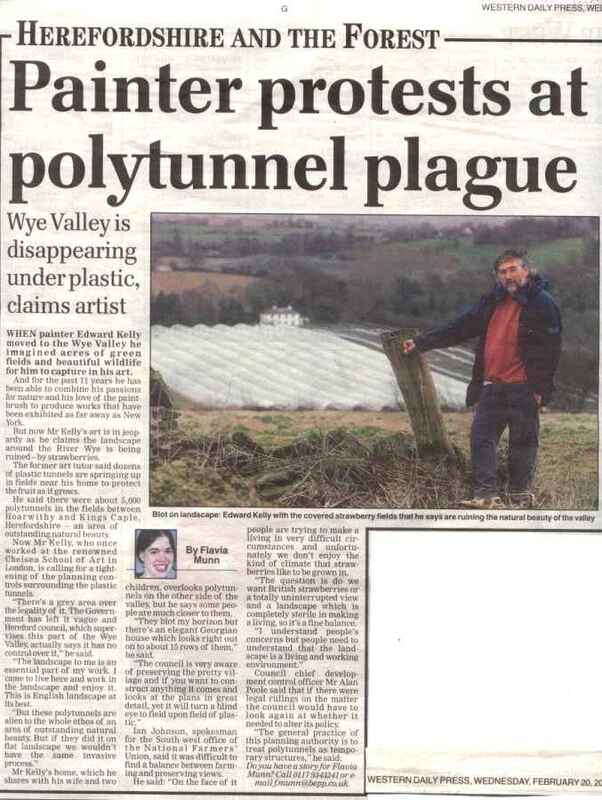 HEREFORDSHIRE THE MECCA OF PLASTIC DESPOILATION polytunnels popping up “willy-nilly”,. Other sites are at; Much Birch, Sutton Marsh, Withington Marsh, Bush Bank, Pencoyd Canon Pyon, Ashford Carbonell, Ledbury, Weston Penyard, Eywas HaroldNot however in the rest of England, they employ sensible controls. AERIAL PHOTOGRAPHS reveal the large number of people affected by three developments. Victims to the whim of Messer’s Drummond, Cockburn and Davies Individuals suffer 12ft high tunnels being erected in front of the windows A village is surrounded by plastic, all night disturbance, social injustice.An Area of Great Landscape Value destroyed. 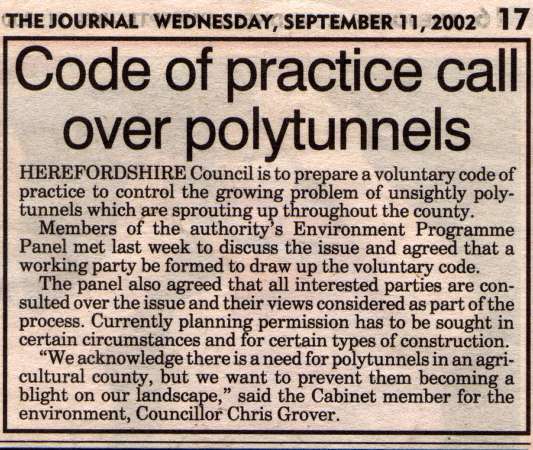 Non-required for polytunnels in Herefordshire, not even in the AONB. Hereford Council says polytunnels are” temporary structures”. By contrast, Hereford planning decided that a shed of “Wendy House “ proportion larger than ten cubic metres sited in Hoarwithy may be detrimental to the Area of Outstanding natural beauty. 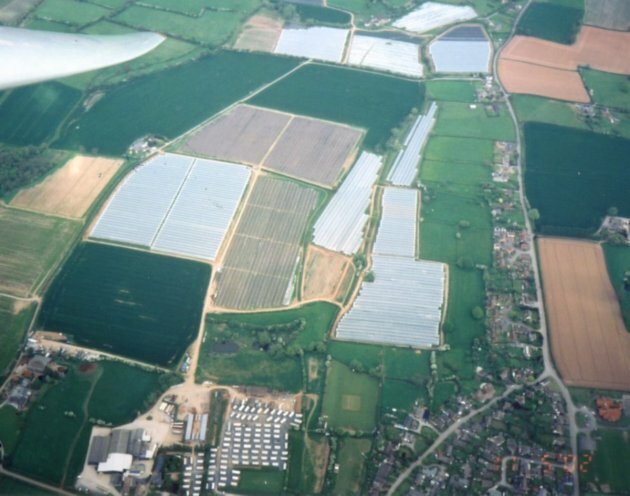 Our village is surrounded by polytunnels ONE HUNDRED and SIXTY ONE THOUSAND SEVEN HUNDRED & EIGHTY NINE TIMES larger than the 10 cubic metres considered harmful to the Area of Outstanding Beauty. Mrs Rathbones “Wendy house” is hidden in the rear garden, polytunnels are destroying the open valley and village environment but require no planning consents a “ Wendy house “does. Such is the absurdity of Hereford planning do we assume that if a” Wendy house” was a hundred and sixty thousand times larger and seen from the air it might also evade their attention. 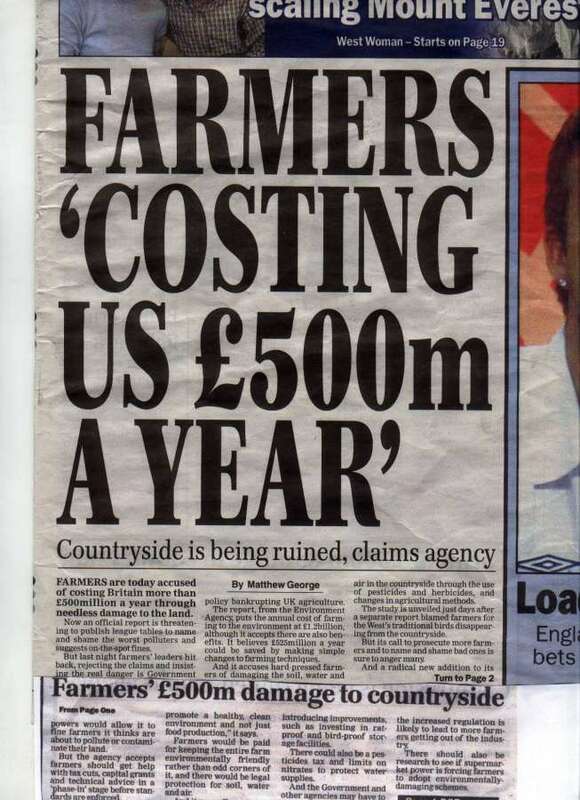 2000 Hereford Journal, "FARMERS RUINING THE VIEW", by Lawrence Hurley. A Kings Capel fruit farmer is facing local opposition over his plastic covered "polytunnels" which he uses to farm strawberries. Neil Cockburn of Pennoxstone Court, supplies supermarkets with early strawberries and he says he needs the protection for the spring. Ed Kelly a landscape artisr from Hoarwithy whose home overlooks the feilds has complained that the tunnels ruin the countryside. He is planning a petition based on Hoarwithy residents in the Wye Valley Areas of Outstanding NaturalBeauty,although he claims it will not be naming any particular farmer. He says he believes that the use of tunnels is a problem he has encountered throughout Britain and Europe." It's realy awful" he said But people have a blind spot because it's farming. Andrew Blake from the Wye Valley AONBadded" It is a tricky one. They are not particularly attractive features ,but are for a perfectly appropriate agricultural activity.He noted that farmers did not need planning permission because they are not permanent structures. "Farming has a revered place in legislation " he said. Mr Cockburn said "I wasn't aware that anyone didn't like them .I put them up as late as possible and pull them down as soon as possible. The supermarket insist we do it. "I am very happy to talk to any one who has concerns about it" He added this years tunnels will be removed at the start of July. Andrew Blake then knew of the Brinkman versus Chichester appeal , he declares his knowledge in his letter dated 7th Marc2002 "I was aware in 1998 0f a fortcoming Public Inquiry in Chichester"
Whilst some tunnels might be removed in July as Mr Cockburn indicates others remain and this is an all year round blight year upon year. 20th December 2001, Hereford Times, "But no thanks for this blot", by P.Hoskins. Madam ,We have for many years made twice -annual visits to Herefordshire staying near the village of Marden and enjoying the very pleasant countryside in this part of the country. However on our last two or three visits we have been horrified to see much of that area strewn with the most ugly structures of large metal hoops, in summertime covered in unsightly plastic. We understand that this is an intensive form of strawberry growing,but it seems to us the natural beauty of the area is being sacrificed to this .These wretched structures appear to be sited close to homes and gardens and must cause great stress to all who previously enjoyed an unobstructed view. We are told harvesting the strawberry crops entails much disturbance and noise from vehicles and people when the villages are trying to get a night's rest . The development is surely something the local authority can , and should seek to control. 10th January 2002, The Hereford Times, "Tunnels across a great divide", by Peter Simkins, chairman of The Friends of Hoarwithy, Hoarwithy House, Hoarwithy. MADAM, Straw berry feilds forever (P Hoskins letter December 20); The natural beauty of the area is being sacrificed by hoops covered in plastic. The development is surely something the authorities can, and should control. Our council does not have powers to control polytunnels structures of a temporary nature ,with no concrete footings .these temporary structure last for nine months from December each year. Tourism, holiday cottages and guesthouses will suffer because who will want a vacation overlooking plastic hilst listening to the noise of river pumps ?I am sure the value of my house with unparalleled views of polythene ,will drop. Growers claim they help the local economy ,but vast numbers of workers are drawn from Eastern Europe. photo: published in Hereford Times article, "Blot on beautiful face, or necessity"
15th April 2002, Hereford Times, "Blot on beautiful face or necessity", by Edward Kelly, Hoarwithy. Once one of the most beautiful areas of the Wye Valley between Kings Caple and Hoarwithy has now become a white plastic wasteland, two to five thousand hoops per field, mile upon mile of polytunnel. It is sad to witness each year more green fields being lost to this plastic blight. The government could have acted, and in their recent white paper, brought farming in AONB, s firmly within planning controls. The Dept of the Environment has left the legality of these structures uncertain, it states whether polytunnels fall within present planning controls is ultimately a matter for the courts. Hereford Council interpret that they have no controls There is a conflict here, whilst exercising strict planning regulations of all building development to preserve and enhance the pretty village,pollution on grand scale is given free reign in the surrounding environment However New Legislation exists( “Skerrits of Nottingham Ltd v. Secretary of State for the Environment March 22 2000) and forms the basis for control. This I now discover was provided six months ago to the council by a solicitor making representation for a community of Marden also experiencing polytunnel blight. I myself have written four times to the AONB offices and received not even an acknowledgement; it must be tough to adhere to the opinion that this still remains an Area of Outstanding Beauty. 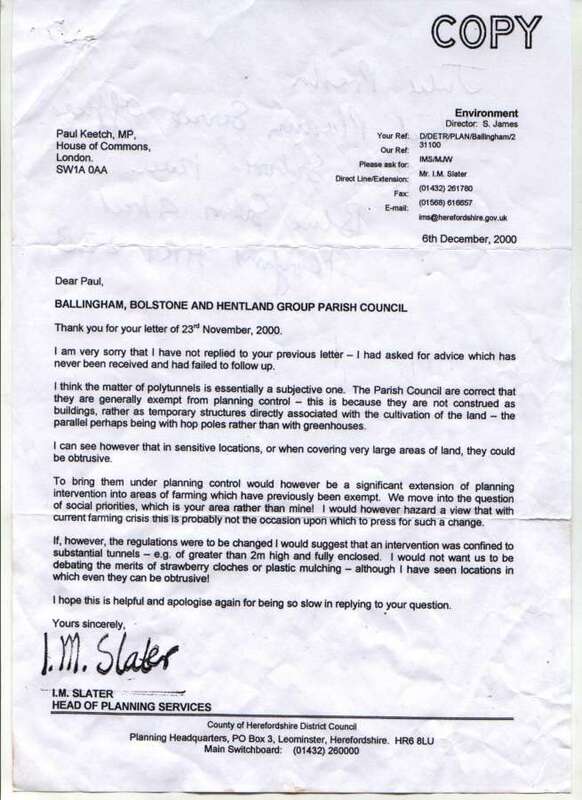 The parish council s of Ballingham Bolstone and Hentland have written to Paul Keetch with the resolution, ”Structures of a temporary nature such as Poly Tunnels that do not fall within the current constraints of planning procedures should be subject to appropriate controls to protect sensitive areas such as “Areas of Outstanding Natural Beauty” The Farmers continue to erect tunnels in open valley beside the flood plain and surrounding houses, obliterating more views. Blame is on the demands of the supermarket; the supermarket in turn claims it is only responding to the wish of the public to eat strawberries out of season. (Peter Simkins, chairman of The Friends of Hoarwithy Jan 10) ”Tourism, holiday cottages and guesthouses will suffer because who will want a vacation overlooking plastic whilst listening to the noise of river pumps?” Indeed walking and enjoying tranquillity and historic sites is the main attribute of the AONB. Polytunnels form a prominent year round blot seen for miles on roads and footpaths. Who enjoys seeing Kings Caple church besieged with tunnels or the river with pounding pump? Apart from not eating strawberries what can we do about it? Write to them all, include Paul Keetch MP. One representative of the National Farmers Union responded “ if you think your valley looks like a lake then the south of Spain looks like a sea” Do we allow this to be the future of the most glorious English landscape? Statement made by Edward Kelly, Painter. Question, “The concern with landscape is central to your work. Why did you choose to come here to live”? As a painter I came here to live and work in the Wye Valley. I chose this because it is amongst England’s best landscape second to none. The River Wye is a main geographical feature. Here alongside the river, the valley is at its finest and most sensitive, now it is being destroyed by plastic. My objection is not just for me but also for everyone who lives and visits this area. Question, “What do you say to people who say the farmer is only earning a living”. Mr Cockburn said as a response in this report "I do not think they are an eyesore"
Kings Caple parish council in response to Hentland Balingham Bolstone parish councils resolution for controls, Councillors at Kings Caple Are in agreement that the constraints proposed in your resolution would “kill off active enterprise within the village”. It was further noted that the activities associated with polytunnel farming within the village” are in general of benefit to the village” It is important to know that the polytunnels stand on the land of the chairman or ex-chairman of Kings Caple parish council, David Jenkins and also on the land of the* family * of parish councillor Philip Brandram Jones again a council with disproportionate representation. These so called farmers have total lack of consideration for others, raising 12 foot tunnels across the windows of a neighbouring house, totally anti-social, irresponsible, fuelled by greed and insensitivity. Neil Cockburn Says” I do not think its an eyesore”. Though there is a notable absence of any tunnel in front of his Court House whilst Hoarwithy village is treated to the rump of his activities. "I am a Parish Councillor in Kings Caple, but I am not the landowner of Any land where polytunnels are erected,nor derive any income from any of The farming enterprises undertahen by other members of my family throughout parts of Herefordshire.The site states a disproportinate representation by "farming community" there is, suprising for the region only one full-time farmer on this small rural Parish Council"
I am an international satelite telecommunications engineer and also Choose to live in this most lovely part of South Herefordshire.Is there a disproportinate representation of electronics engineers on this Parish Council too??? "Mr David Jenkins ,as a landowner with polytunnels on site, declared an interest and signed the pecuniary/ Non Percuniary Interest Book. Councillors agreed that such constraints would kill off active enterprise and noted that the activities associated with polytunnel farming within the village were in general ,of benefit to the village" A letter was forwarded to Paul Keetch. In response to Philip Brandram Jones objection regarding "disproportinate" farming representation we make the following observation. One parish councillor has "family" land on which polytunnels stand. Other councillors are not "fultime" farmers. Normaly on a small parish council there are four councillors How many councillors are on this parish council? With the exception od David Jenkins these councillors do not live near and still enjoy "still this most lovely part of Herefordshire". They do not daily wtness the devastating effect of these polytunnels or apparently care They write to the MP to actively promote further development.. Considering that only 7% of people in Herefordshire work in agriculture and only a very small percentage are also landowners .stating that there is "disproportinate representation" is an understatement.. The residents of Kings Caple were largely ignorant of what action the council were taking to actively promote this "enterprise"
and went on to make formal complaint to the Ombudsman ,see "Peoples Voice" and following letter. 15th April 2002, Hereford Times, "Polluting this lovely Country", by E.Wright, Kings Caple. Madam, Ms penny’s contention that intensive farming is the only way to survive is laughable. Tell that to the Prince of Wales a committed campaigner against such farming methods who has introduced his own range of organic produce. These monstrous polythene tunnels polluting this once beautiful countryside around Kings Caple are not growing food for the benefit of the people. They do not provide work for the locals as those who work in them are imported from Eastern Europe all they do is turn the village into the rural equivalent of an industrial estate…Herefordshire will lose an important source of its income tourism. Take away this county’s beauty and what reason is there to visit it? MADAM, I'd like to support Edward Kelly's letter today about the hideous spread of polytunnels by citing an even worse example. The view of Hergest Ridge from the south has been completely destroyed by very extensive polytunnels at Huntington. Hergest Ridge is one of the greatest sights ont he Welsh border, and the whole area one of the most beautiful in Britain. If the council doesn't wake up soon, the area wil be comprehensively wrecked. Incidentally the soil beaneath the polytunels is covered in black plastic and its natural life suffocated. These tunnels are both ugly and appalling farming practice. photo: appeared in The Ross Gazette, "Why destroy our most glorious landscape to produce a strawberry without a bumpy nose?" 20 June 2002 , The Ross Gazette, by Edward Kelly. "WHY DESTROY OUR MOST GLORIOUS LANDSCAPE TO PRODUCE A STAWBERRY WITHOUT A BUMPY NOSE?" Why destroy our landscape for a strawberry without a bumpy nose. What catastrophe could possibly warrant such extreme measures? War torn Britain where democracy has been suspended in the urgent need to provide food for the nation? A third world country threatened by famine? Development is now in the heart of the Wye Valley AONB, at Kings Caple alongside the main geographical feature in Herefordshire the river itself, in open valley and amidst historical buildings, the most sensitive location in an area of great landscape value, site of special scientific interest. The residents of cottages in the picturesque Hoarwithy village hugging the high west bank of the river once enjoyed a vista of apparelled loveliness, born from centuries of care. Now they are compelled to look out across a white wasteland, field upon field of billowing plastic sheet and hideous polytunnel, surely the most visual polluting agricultural method ever. Development is also happening on vast scale a 150 acre site in the Wye Valley AONB at Hom Green Ross on Wye. We are proudly told this AONB enjoys the highest status and protection, that all development is secondary to the preservation of this landscape. The future looks forward to bigger tunnels in a variety of colours to cover trees. Clearly many farmers need to diversify if they are to make a living but this is not farming in any previous convention of the word this is third world factory enterprise in the midst of the most glorious English landscape. What urgent provision of food crop warrants this destruction? Well apparently it is the need to grow a strawberry without a bumpy nose. The supermarket drives this insanity insisting on a grade “A” crop, not an ordinary crop but a variety particularly prone to rain damage. Grown in the open a strawberry grower can achieve 50% grade” A” and expect to sell 75% of his crop. Under plastic however he can sell 80% so the destruction of our best landscape is for 5% increase of sale, profit for the few loss to the many. Funding from Brussels aids and abets this madness. The supermarket presides over this despoliation of our landscape providing for “soupe aux fraises”. Better to have vast swathes of plastic ugliness across Herefordshire’s finest asset its landscape than display on shelves strawberries with bumps, the result of natural elements. I have a letter from Sainsburys which reads “We do purchase strawberries grown in polythene tunnels from the Wye valley,- I assure you we do pay close attention to the environmental impact of everything we do”. 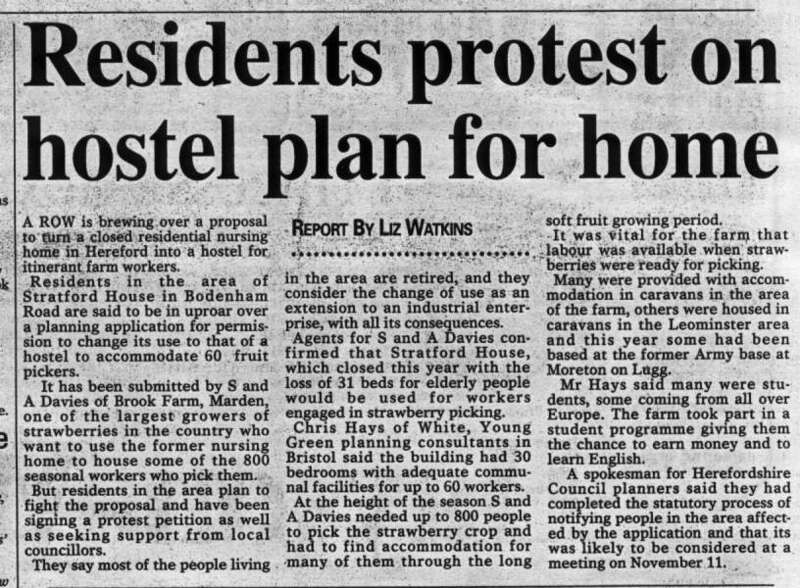 On June 15th 1999 The Inspector for the Secretary of State ruled that polytunnels do require planning consents and should not be allowed in an AONB. Hereford Council have failed to implement this ruling indeed they have concealed this decision; even now they offer spurious legal argument to divert focus. Large numbers of people through out Herefordshire have now made complaint to the Ombudsman against the council for maladministration and injustice. Neil Cockburn expounds the view that any decision that prevents the use of polytunnels will have a knock on effect across the country and would terminate UK strawberry growing. This is clearly not the case. Other authorities i.e. Worchester hold the view that polytunnels are agricultural buildings and require planning consents This legal ruling accepts that polytunnels are a fact of modern production methods and hence polytunnels should be placed in sensible location subject to the democratic planning process as applied in all other planning decisions. Mr Cockburns polytunnels have been raised without any planning consents they surround peoples houses, our historic churches it destroys our village environment, he believes, like Hereford Council, that we should have no right to object to his antics. This is in the midst of the finest landscape a large-scale factory production process against the whole ethos of “green “ framing in the AONB. Edward Kelly’s response to Neil Cockburn’s defences of the factory farmers; assumed “right" to cover the land we all love with plastic sheeting (“Destruction of landscape” 20th June 2002) echoes what must be felt by everyone who has regard for the beauty of the British countryside and particularly for the “outstanding natural beauty of the Wye Valley. I would simply add to Mr Kelly’s comments that it is not only those living within sight of this devastation who are appalled, but those who come to visit or who pass through the valley and admiring its beauty, vow to return. Who would want to stay–in or return to such magnificent riverscape, which has been vandalised in this way? Undoubtedly the most important resource we have in this part of the county is its natural beauty. Polytunnels and plastic sheets are spreading like an ugly uncontrollable rash destroying what is a God given asset. As if the set backs caused by the effects of foot and mouth were not enough, we now face the pernicious disease of shortsighted greed. Are we to allow the authorities (remember, we elected them) to permit this continued devastation by a handful of insensitive landowners? Do we really want to see our lovely pastoral inheritance suffocated under a shroud of plastic? If the AONB has any meaning at all then those who’s function it is to be “conserve and enhance the natural beauty” of the valley should be seen to be putting pressure on those responsible for its destruction. -And we should all be concerned for the sake of generations to come. 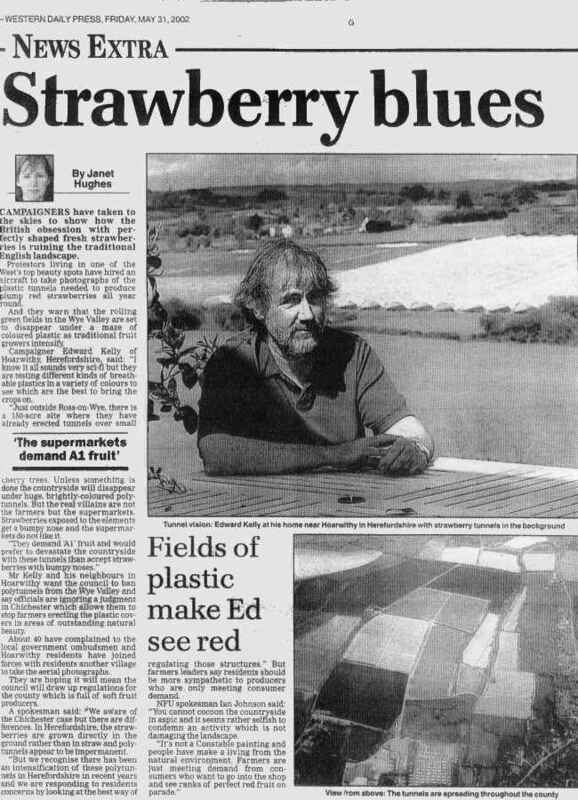 20 June 2002, Hereford Times, "Pixley fruit grower receives MBE"
Angus Davison, The 37-year old who founded the world-renowned Haygrove Fruit at Pixley supplies strawberries to al the UK's main supermarkets and is the major supllier of polytunnels across the world. 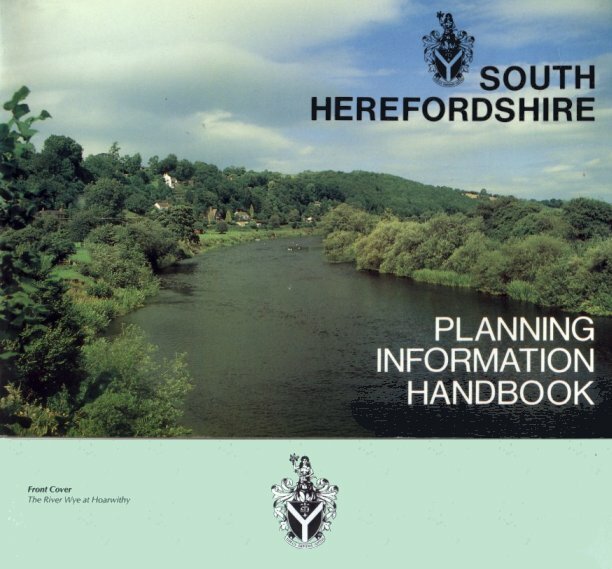 But the innotative entrepreneur say'she was "absolutely horrified when he heard about his MBE"..
South Herefordshire Planning Information Handbook Front Cover proudly presented a picture of what was once considered the gem of the Wye valley Area of Outstanding Natural Beauty, the river Wye at Hoarwithy. If they now turned their camera 90% they would behold seventy acres of plastic and polytunnel. This has destroyed the environment of this once beautiful village. They have ignored three of the prime directives controlling all other planning issues because polytunnels do intrude into prominent views from hillsides they are of immense scale, larger than any industrial estate you might imagine, they stretch across open countryside and they invade the attractive setting of notable historic Hoarwithy church whilst physically surrounding the church at Kings Caple. By contrast the planners reject permission for a small conservatory restaurant extension to our village pub apparently its tiny foundation decreased the absorbency of the flood plain whilst the enormous rainwater run off from acres of plastic is ignored. This policy is mad, totally wrong and irresponsible. Hereford council have denied the democratic right for individuals aggrieved to assert a view that covering vast areas of landscape with plastic sheet and polytunnel should in no account what so ever be allowed within an AONB. Anyone who doubts the environmental impact of the unfettered development of agricultural polytunnels should take a trip into the Almeria region of south-east Spain.. About fifteen years ago somebody had the bright idea of using plastic green houses to cultivate salad crops on arid plains so reminiscent of America's wild west that Italian film director Sergio Leone made his so called "spaghetti" westerns there back in the 1970's. If Clint Eastwood-the man with no name -returned to ride the same plains today he would have to navigate a virtual sea of plastic now spanning more than 40,000 hectares, a blot on the landscape so massive that it can clearly be seen from space. Ten thousand polytunnels some as big as football pitches send tomatoes, peppers and melons to the supermarkets of northern Europe in a business worth an annual 1.2 billion Euros. Farming families who once hardly scraped a living from the red sandy soil have become millionaires in less than a generation as the almost deserted region attracted tens of thousands of immigrant farm workers from Morocco. But the ecological price has been high. In an area with Europe’s lowest rainfall the salad farmers bored thousands of wells so deep that seawater was sucked into the water table and the local supply now suffers from high salinity. In some areas the greenhouses are so close to the beaches that tourists are discouraged. 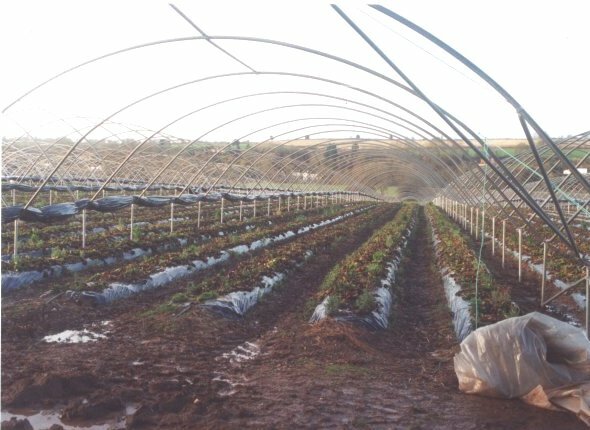 Members of Herefordshire County Council's environmental panel are wise to be considering tighter planning regulations for polytunnels. There seems to be a clear economic case for strawberry growing under plastic, given the creation of 750 full time jobs in the county. Compared with south -east Spain a mere 300 hectares of polythene in Herefordshire is hardly a big problem. But 20 years ago there was none on Almeria. The welfare of the farming community needs to be carefully balanced against the effect unregulated growth of such methods will have on tourism in one of Britain’s most beautiful counties. Aesthetic impact should be high on the list of considerations-acre upon acre of polythene is not a pretty sight. Any large -scale development should be judged on the impact it will have on the landscape. If it is going to be a blot, planners should say no or at least insist on suitable tree planting schemes to hide the greenhouses. The impact has been such that it has resulted in the extinction of the Lynx . This is the fastest recorded effect on the extinction of a species. One aspect of the Voluntary Code” in Herefordshire’s answer to the plague of polytunnel development that has all but destroyed three of the riverside hamlets in the Area of Outstanding Natural Beauty is that relating to the distance that polytunnels may be erected from a persons home .The distance of thirty metres is suggested. I express a view of a person inflicted. Whilst enjoying living in beautiful open countryside, choosing the open space not the city, suddenly a vast ugly plastic industrial development is placed around your home the size of a small town. You are encased all views gone, and of course you have no legal right for a view, you are however allowed a thirty metre measure from the walls of your home, and with the courtesy of the council a rope from which to hang. This rule shows complete lack of empathy little awareness of the deep psychological impact upon people inflicted by these developments. A house surrounded by polytunnels is worthless and the owner cannot sell, a prisoner. You might imagine that where such an anti social production method was to be used the inconvenience should be borne by the grower so at least a length from a person’s home of one field obscured by a distant hedge might be acceptable. This example drawn from Herefordshire’s wonderful voluntary code of practice gives us clear indication that this whole exercise is addressing the commercial greed of the grower over all other social and human consideration. These rich growers operate on such vast acreage yet their pursuit must squeeze to the limit and renders the poorman’s garden irrelevant. Rich polymen wield a power of intimidation and ability to exercise control over neighbours and also the council reminiscent of feudal England. The council have said they will discuss this code further with the growers, alas not the people, to see if they- the growers not the council will allow this distance to be increased.. I speak of this rule but only as a means to illustrate the most appalling lack of democratic rights that this council continues to thrust upon us. My initial concern is the effect these monstrous and ugly sites are inflicting upon the famous Wye Valley AONB, damage inflicted on a National Asset. The environment meeting, to which my wife and I were invited, was filled with an audience representing parish or groups; repeatedly each in turn rose to say they wished for the introduction of planning control and voicing their opposition to the voluntary code. The CPC calls for implementation of existing legal ruling .Yes, I say again there is legal ruling that states polytunnels do require planning consent and should not be allowed in an Area of Outstanding Natural Beauty. The CPC now have a website and make representation to other councils when considering a planning proposal regarding new polytunnel development. Yes other councils do adhere to legal ruling and do require planning consents for such development. However in Herefordshire the council denies its residents any right to object as they would in any other planning issue. Although only seven per cent are employed in agriculture in this county they exert a strangle hold on the council. Hereford times Nov 28th featured the success story of a further �60,000 government grant for further and permanent development of this polyblight within the AONB. The Spanish government says the water is needed for the agribusiness sector that covers much of southern Spain in a sea of polytunnels and plastic sheeting. Vicente Sicilia's company exports 60 million kilos of tomatoes, peppers, cucumbers and celery each year, much of which ends up in British supermarkets. To him the Spanish government's National Hydrological Plan makes perfect sense. "Here in Murcia we've got a wonderful climate, good land and hard working people. There's just one thing missing - water". The idea is to siphon off "excess water" from the River Ebro, which springs in the Pyrenees and ends just south of Barcelona. It involves building 118 dams and more than 1000km of canals and pipelines with an estimated price tag of 18bn Euro. One third of the money is supposed to come from European taxpayers. This thirsty greenhouse economy, which relies heavily on cheap immigrant labour, has brought new wealth to dry and formerly impoverished areas like Almeria and Murcia. "We've created this great miracle in Murcia", says the region's president Luis Ramon Valcarcel. "Like the Israelis we've turned desert into fertile land and we shouldn't be punished for our achievement". President Valcarcel, a fervent supporter of the National Hydrological Plan, also argues that the agribusiness sector plays a vital social role by providing immigrants from North Africa with stable work. A different type of immigrant has also been moving into southern Spain in recent years. The pensioner from northern Europe. By 2020 there could be six million of them - mostly Brits and Germans - living in retirement along the Mediterranean coast. These people, along with seasonal tourists, consume huge quantities of water. hink of all the swimming pools. And in summer time, the average golf course needs 3 million litres of water every night to keep it green. Officially the water is not for tourism or urban development. But now that Spain's ruling party, the right wing Partido Popular, has liberalised water markets, many fear the farmers will simply sell off this precious resource to the highest bidder. Yet President Valcarcel insists farmers in his region will not survive unless the plan goes ahead. He has no qualms about taking water from the Ebro. "Every year the river just throws away 13,000 hectolitres into the Mediterranean Sea and we're just asking for a small part of that water which is wasted", he says. Plans bring conservation problems too Five hours drive to the north, people could not disagree more. Carlos Ibanez, a rice farmer and conservationist in the Ebro Delta, worries that far too much water has already been taken out of the river in earlier dam building projects. With a reduced flow of water, less silt is being carried downstream. As a result, the Delta - a unique wetlands habitat attracting many species of bird - is slowly disappearing into the sea. Local fishermen complain that shellfish stocks have been badly affected by increased water salinity. All over Tortosa, the main town in the Delta, you see slogans, reading: "No Transvasament! - No To the Water Transfer!" And almost everywhere there's the logo of the anti National Hydrological Plan campaign - a pipe with a knot in it. Maria Jesus, a local dentist, joined the Blue March to protest against the plan in Brussels. "I've never been interested in politics before but this crazy scheme made me so furious I just had to do something about it." Jesus and Leonor Corral: "Our son is buried in the cemetery here"
Further upstream, in the foothills of the Pyrenees, the scheme is equally unpopular. Jesus and Leonor Corral will lose their home when their village, and the valley behind it, is flooded. Three other villages, two Romanesque churches and part of the ancient pilgrims' route to Santiago de Compostela will also disappear under water. I don't care what they do but I will never leave my home", says Leonor sitting in her front room in the little village of Eres. Her husband Jesus adds: "Our son is buried in the cemetery here. I won't be able to bear it if we have to move his coffin". Many say this water policy, which is causing so much distress, does not even make economic sense. It is seen as a scheme to provide lucrative contracts for Spain's powerful construction industry. If the multi million Euro plan goes ahead, it will be the most ambitious infrastructure project in Europe. But its critics see the plan as outdated, environmentally destructive and mired in scandal. They say it is a project designed by and for the construction industry - an industry that has disturbingly close links to Spain's political elite. Spain's water politics will be broadcast on Thursday 8 August 2002 on BBC Radio 4 at 1100 BST. Repeated on Monday 12 August 2002 on BBC Radio 4 at 2030 BST. Polytunnels, used for growing soft fruit and vegetables throughout the year, have sparked controversy in the countryside. Some of Britain's most beautiful landscapes are being obliterated beneath layers of semi-permanent plastic, according to campaigners. The protestors say the use of polytunnels in agriculture has led to a complete change in the appearance of hundreds of acres of countryside. Farmers, however, claim that the technology enables them to extend their growing season, thus competing with international markets whilst also minimising the use of pesticides. Charlotte Smith reports. 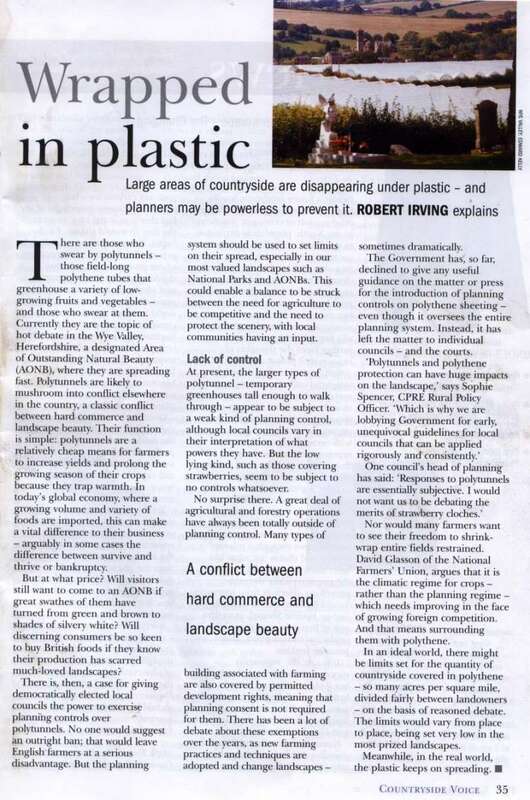 "As polytunnels roll out across the landscape they threaten our National Asset the ladscape.It is obviously having visual impact and in turn thse rural areas will suffer economically.The foot and mouth crisis taught us to realize the economic sense and importance of caring for our landscape"
Large areas of our most beautiful landscape buried under semi permanent plastic. Obtaining planning consents is cumbersome and we need to act quickly when planting a crop. Herefordshire planning classing polytunnels as temporary structures allows these to be constructed anywhere without planning consent to destroy our finest landscapes an AONB surround a village or be in front of any persons home. We have strawberries in November but at what cost? The Wye Valley Area of Outstanding Natural Beauty now an Area of Unnatural polytunnels. Unless we act now further swathes of our finest countryside will be under plastic. More misery for rural economies. In relation to the 150-acre polytunnel site at Walford south of Ross on Wye within the Wye Valley AONB thirty people in the community of Hom Green made complaint against Hereford District Council for “maladministration” and ”injustice” The polytunnel site is raised bt Mr Eric Drummond. Homme Green . Forest of Dean requires planning consents for Spanish tunnels on rotation crop. Mr Angus Davison the main supplier of polytunnel in Herefordshire who held the floor at Herefordshire council’s environment meeting and who no doubt as part of his marketing strategy has been telling growers that they do not require planning consents is now being asked by Forest of Dean Council to submit planning consents retrospectively for his own development at Newent. Mr Davivson has and intends to erect polytunnels over a rotational crop the very same type of tunnel and the very same method of production that Herefordshire believes should have no planning consent what so ever even when in England’s finest landscapes the famous Wye Valley. "They don,t live in the real world ,.people protesting are fat and lazy"
"My message to people who critise me is ,This is the real world ,Start living in it"
Many of these developments receive aid and grants provided by the taxes paid by the very people Mr Davison so arrogantly attacks. Both these gentlemen live in the "real World"
I wa serving in the Royal Navy from 1930 1945. Also I happen to know that Nicholas Baker a fellow protester was in the Royal Marines. Chris Wooldrge Tewkesbury Road Newnt. In reply to your article on polytunnels at Newtown Farm Newent ,I would like to make the following points. 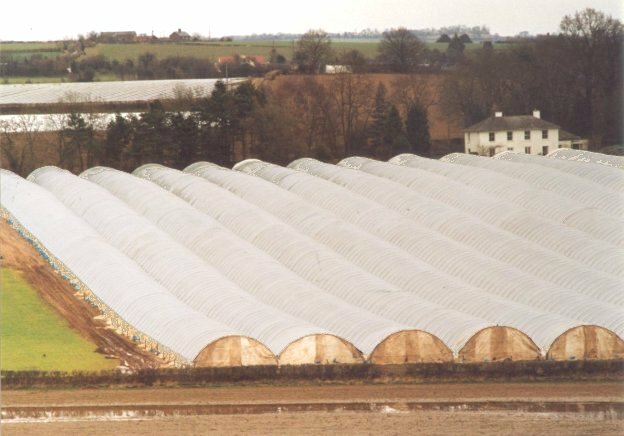 Perhaps I can supply some real facts on polytunnels based on current practice just down the road in Herefordshire a county that doesn,t consider planning permission is neccessary for these plastic roofed factories. Polytunnels are dangerous when sited near homes.High winds can and have lifted the plastic and the frames into the air ,have done structural damage and brought down overhead telephone and electric lines. Polytunnels blight large areas of once attractive landscape ,turning away tourists and ruining residents views. Polytunnels of this scale create flash floods and major drainage problems. Polytunnel shemes provide few local job opportunities.Most installations are serviced by casual immigrant labour. Polytunnel crops of this scale are worked around the clock,substantialy increasing traffic noise and sleep disturbance. No ,MrDavison, Idon,t want to live in your "real World" of strawberries in November ,but in my real world where the sound of birdsong can still be heard and where good quality seasonal food is grown in a comminity that people want to live in and come to visit. 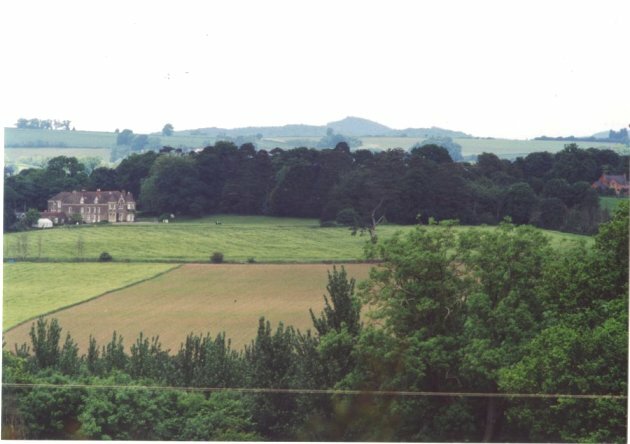 As we anticipated this opinion confirms previous solicitor advise that Herefordshire Council are wrong in not implementing the "Brinkman Brothers" decision and the council in its attempts to distinguish between polytunnels using trestle method and those directly over soil is "irrational" and the proposal made within the voluntary code are both "arbitrary" and "irrational"
Click on LEGAL to continue.